Mahavir Swami is the great hero of Jain followers. We carve and design Marble Mahavir Swami Statue using premium quality marble that is tested for its varied features. These statues are available in various dimensions and as per the specifications of the clients. This statue offered by us is used as decorative models in various places. These are widely appreciated for their long lasting nature, durability and perfect finish. 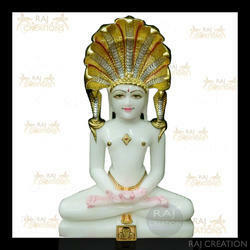 We are offering Marble Mahavir Swami Murti to our clients. We supply this product in India and majorly export it in USA, UK, Thailand, China, Japan, Malaysia, Australia, Singapore, Canada, France, New Zealand, Trinidad and Tobago, Spain, Netherlands. We do home delivery of this product. Courier charges may apply and depends on delivery address and measurement of Carton(s) containing number of pieces. *Delivery period is for MOQ. Production Capacity: 10 Pieces per month. Packaging Details: Carton box with thermocol support as product is small. 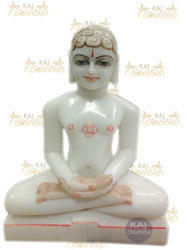 We are offering Jain Statue Stand to our clients. We supply this product in India and majorly export it in USA, UK, Thailand, China, Japan, Malaysia, Australia, Singapore, Canada, France, New Zealand, Trinidad and Tobago, Spain, Netherlands. Production Capacity: 5 Pieces per month. Packaging Details: Wooden or aluminium box(with foam packaging) as per customer's requirement. We are offering Marble Mahavir Swami Idol to our clients. We supply this product in India and majorly export it in USA, UK, Thailand, China, Japan, Malaysia, Australia, Singapore, Canada, France, New Zealand, Trinidad and Tobago, Spain, Netherlands. 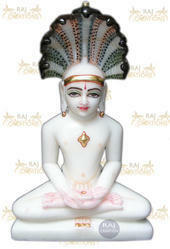 We are offering Marble Jain Mahaveer Statue to our clients. We supply this product in India and majorly export it in USA, UK, Thailand, China, Japan, Malaysia, Australia, Singapore, Canada, France, New Zealand, Trinidad and Tobago, Spain, Netherlands.